If you’re looking for an offbeat surrealist comedy, then Sorry to Bother You is one you have to see this year. You don’t get to see experimental indies too often anymore that are both outrageous yet coherent, and where writer/director Boots Riley scores satirical points is on issues of racial inequality, office politics and capitalism. If it’s not a perfect film it’s because it gets too drawn out with heavy bantering in the second half. But that doesn’t mean it isn’t highly watchable and audacious. The start has the feel of something that could be called “Office Space Part II: The Oakland Sect.” LaKeith Stanfield stars as Cassius Green, a dilettante living out of a garage who gets a job as a telemarketer. He’s not converting sales in his first week, but when he learns to put on a “white voice,” he becomes the star salesman of the floor which irks his co-workers who are trying to form a union strike. Cassius gets promoted upstairs to make big bucks as a Power Caller, making him less invested in his associates’ earnings woes. At home, his artist girlfriend (Tessa Thompson) is repelled by his white voice which becomes harder for him to suppress. Cassius continues to forge big career advancements, making a high impression serving a corporate client called WorryFree, which is a new sensation taking over across the globe. Take a breath, because this is where things get really out there. Citizens who commit to WorryFree get room and board plus food for the rest of their life in exchange for free labor, i.e., a lifetime of serving a menial job. Of course, there are protests in the outside world that say it connotes corporate slavery. Nonetheless, Cassius gets to meet the CEO Steve Lift, played by Armie Hammer whose performance goes gleefully over-the-top. This performance stylization is called for, and I would have gone even bigger in over-the-top acting, like Robert Downey Jr. in “Natural Born Killers” big (but I digress). Lift makes Cassius an outlandish offer: A contract to amount enough money for life, to put him in the 1% top, if Cassius goes undercover and became a faux Martin Luther King civil rights crusader type to half-men, half-horses for a five year contract. Cassius has met the first prototypes of half-man, half-horse and it’s revolting. Look at my film cousin companions below. 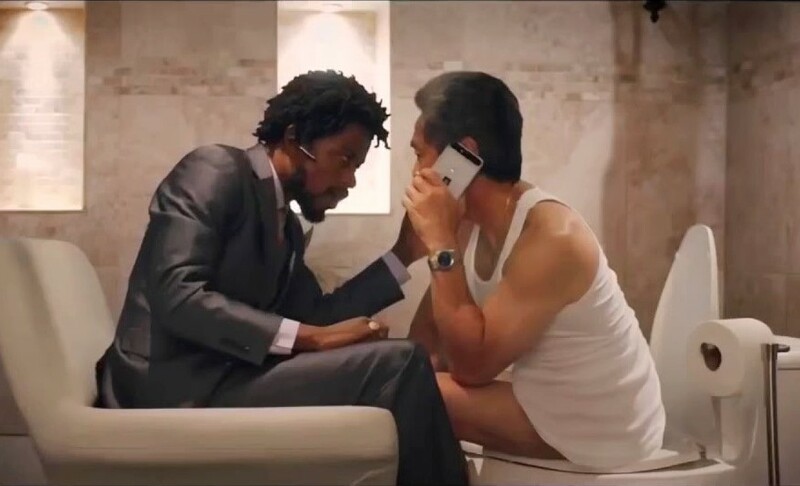 “Sorry to Bother You” is a definite companion piece to “Office Space” with satirizing of the modern office drone. It has the sociological offbeat kilter of “The Lobster.” It says so much more about downsizing and the sacrifices therein, of surrendering certain human rights, in a more interesting way than “Downsizing.” And it says more about racial politics than the recent “Blindspotting” film did. The story could have zipped along at a faster clip in the second half, smacking us with things left and right without over-explaining. Nevertheless, do see this whacked Boots Riley film. There’s a lot to marvel. Film Cousins: “Office Space” (1999); “The Lobster” (2016); “Downsizing” (2017); “Blindspotting” (2018).